The racist Reverend Wright wanted God to "damn America." Jesse Jackson called New York City "hymie town." Various Evangelical preachers have been heard to utter some pretty nasty comments here and there, as well. So, flawed as we are, apparently being religious doesn't preclude a venomous diatribe now and again. And now comes hate wrapped as political commentary from another supposed person of faith, this time in Newsweek. Wendy Doniger is a columnist for Newsweek's "On Faith" beat and is also the Mircea Eliade Distinguished Service Professor of the History of Religions at the University of Chicago’s Divinity School. But that doesn't seem to have made her less of a venom spewing, wiled-eyed Republican hater, unfortunately. Naturally, like all women such as herself, all her hate is directed at Governor Sarah Palin -- also showing that these sorts of women aren't interested in helping strong women to public influence but only their kind of mindless ideologue is acceptable. Doniger starts her hate-filled rant in All Beliefs Welcome, Unless They are Forced on Others with what will shortly turn out to be a lie compounded by a blind assumption based on no proof to shore up her claims that Sarah Palin's exclusively allows her religious beliefs to direct her public actions. Would Pro-Life Republicans Revolt Over Ridge? If there's one person in the NBC news stable who combines solid analytical skills with a commitment to fairness, it could be political director Chuck Todd. Evidence thereof comes from no less a certified conservative source than Tom DeLay. 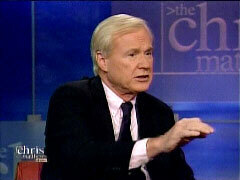 Appearing on this evening's Hardball just after Todd had offered his breakdown of the electoral map, DeLay allowed that he "can't dispute" any of Todd's analysis, prompting Chris Matthews to exclaim "that's a development for us here: objective truth for you!" So what was that Todd analysis that DeLay didn't dispute? There was much to it, but for present purposes let's focus on this: Todd can't see how Obama wins without Pennsylvania, and that having former governor Tom Ridge on the McCain ticket would help deliver the Keystone State. The catch is that Ridge is pro-choice, which in turn poses the question of whether pro-life Republicans would revolt if McCain chose him for the veep slot. You'll find the transcript below. I'd be particularly interested in getting the take of pro-life readers. I offer my own two cents at the foot. 'Conservative Court' That 'Made Bush President' Now 'Balanced'? As a deeply divided Supreme Court issued 5-4 rulings the past few weeks bouncing from liberal to conservative interpretations of the law, something was woefully missing from the coverage: journalists apologizing to the nation for regularly insinuating that the Court's December 2000 decision concerning Bush v. Gore was politically based. After all, for seven and a half years, a regular media meme has been that a "conservative Supreme Court" gave George W. Bush the presidency by stopping the recounting of votes in Florida. New York Times legal reporter Neil Lewis's Wednesday filing was headlined "Stark Contrasts Between McCain and Obama in Judicial Wars." But the truly "stark contrast" was how Lewis treated the respective camps with regard to their hypothetical Supreme Court nominations. Lewis painted an uninvolved McCain as paying "fealty" to "the conservative faithful," while an engaged Obama would be merely trying to reverse the "current conservative dominance of the courts" without displaying any liberal ideological thrust of his own. Back in 2003, Lewis identified Republican Sen. Orrin Hatch as a "leading conservative," but Sen. Ted Kennedy was simply "Democrat of Massachusetts." His Wednesday report showed a similar contrast, with tons of "conservatives" (18 in all in a 1,400-word story) emanating from the McCain camp but not a single "liberal" to be found around Obama. Such was clearly evident Friday evening when Bill Moyers discussed some recent Supreme Court rulings with CNN and New Yorker magazine's legal affairs analyst Jeffrey Toobin. At least they're open about it: the New York Times disdains Supreme Court justices who hew to the principles upon which this country was founded. The Times's admission came in the course of an editorial calling on Obama and Clinton to put aside their bickering and focus on beating John McCain. That is vital, in the Times's view, given McCain's pledge to nominate Supreme Court justices in the mold of John Roberts and Samuel Alito. History was made in Louisiana today. Bobby Jindal took office as the state's new Governor. Jindal is 36, the son of Indian immigrants. He's Louisiana's first non-white Governor since Reconstruction, and the nation's first elected Indian-American Governor. Jindal, a former Republican Congressman, vowed to clean up Louisiana politics and speed hurricane recovery. A new CNN report on New York City Mayor Michael Bloomberg's quiet "research effort" to assess a possible presidential bid as an independent, is cleverly written to imply that Bloomberg is a dissatisfied Republican. Bloomberg, a lifelong member of the Democratic Party, decided to run for mayor as a member of the Republican Party ticket. According to CNN legal analyst Jeffrey Toobin, the election of a Republican president in 2008 will bring a certain end to Roe v. Wade. Time.com: Your book strongly suggests that personalities and personal views are more important than case law. "I covered those confirmation hearings. I went home at night in tears. -- Dahlia Lithwick, Slate.com's Supreme Court reporter, talking at a Yearly Kos breakout session about the Senate's confirmation of Alito and Roberts and Democrats being too soft in their questioning. Oh, and on a related note, Time magazine is spending money to wine and dine the Kossacks.